From the artist Randy Bryhn: "Made from stained Walnut, the dark color has made this type of wood sacred to most Native American clans that knew of it. It's dark color seemed to hint of mystery, and as a result was a favorite wood to be used by the medicine man of the clan. The finger-hole area is etched and darkened, while the Byrd has a wing type design for use outside in a breeze. This flute is a full size man’s flute, and measures approximately 23 inches in length. This is a flute with an excellent voice that would be good for both inside and outside playing. The profile of this flute shows a long slender body that is excellent to play on. Walnut is a very close grained wood that has performed for me well in the past, and seems to play well even on very humid days. I held off etching, and decorating this one because the wood grain was so pronounced. The voice is really nice, and is very stable in the bottom finger hole. The end of the flute is squared off, and blunt, as an alternative to the tapered design I usually put on my flutes. The Flute Fundamental Note is: SHARP “F”. The flutes I make are considered very rare. Not only is the plains tuner one of the original designs, and not used very much today, but the flute actually was hand whittled. In today's world anything made by hand is hard to find, and through my own researches I only know of one other mainstream flute maker who hand whittles his flutes. 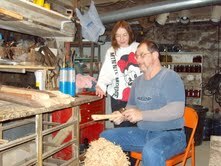 However, he also has also gone on to use a lathe in his creations, so it is quite possible that I am the last. Currently I am celebrating the making of my one thousandth flute, after eleven years of selling flutes here, and at gatherings. I hope you like the flute." 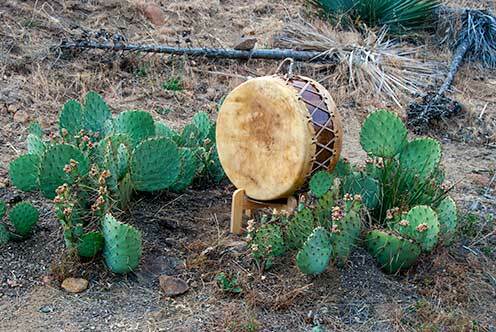 More from Randy Bryhn: Normally, EVERY Native American brave, no matter what tribe had to make a flute. In some cases it was made by the brave’s father, and presented to him upon becoming a man, and sometimes if the brave could afford it, he would purchase one. It should be noted though that a flute in those days was worth a horse that had been broken for riding, in other words very costly. Before the advent of the tuner though, flutes were very hard to play. The whole ceremony was the making of the flute, since without a tuner they are extremely hard to play. The brave would take sometimes as much as a month to produce the flute, and by that time everyone in the camp would know his intentions, especially the girl’s father. The brave would then go to the father and ask permission to ask for her hand. If agreeable the father would give the brave some splinters, they were what had been called matches in those days. That night the brave would come to the girl, and hold the burning matches near her. If she wanted him then she would blow out the matches, if not he had to leave the dwelling…that’s when things get rough. The whole idea in the beginning was to NOT play the flute, because it wasn’t user friendly back in the early days. The next day as the girls would exit the dwelling the brave would be playing the flute, and when he saw his beloved his would alter the tempo of his song. This to show her that she was indeed the girl he longed for. I have one of the early flutes made in this fashion and even after many years of trying I can only make it squawk a few broken notes. After the wedding ceremony was complete the brave would then bury the flute, (probably in disgust), but with the introduction of the tuner things changed and the flute became a prized possession that was kept by the brave. In those days it was considered a man’s item, and the women were not allowed to touch it, ever. When I discussed making a flute for my wife with my mentor, he was at first upset with me. “This is a mans item,” he said to me. Yet when I asked him who most of his customers were, he agreed that most of them were women. Now he is not angry with me any more, and I have noticed some of his flutes have gotten noticeably shorter…though he won’t tell me why. 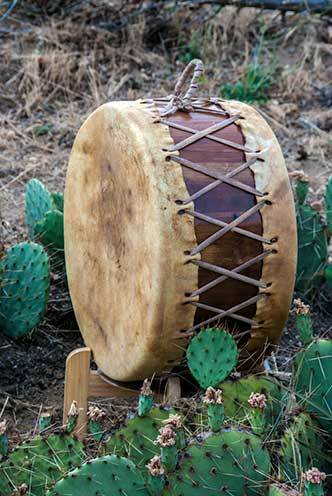 Buffalo Hide on cedar, 18" x 10"